This week, postgraduate researcher, Josefina Bravo, gave a rapid presentation of part of her PhD research to members of the Loddon Observatory. The session featured a wealth of environmental research on farming, water quality and sustainable agriculture. 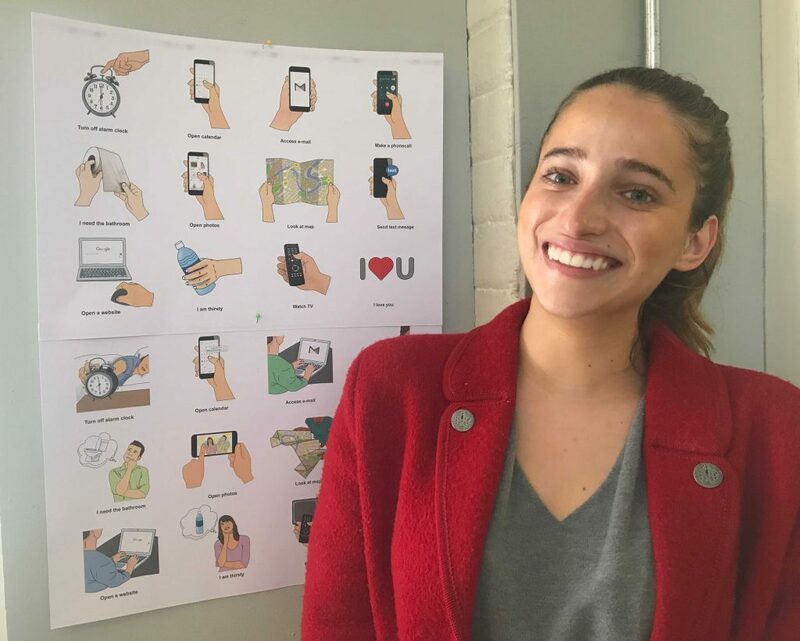 Josefina’s research into designing information to build flood preparedness, highlighting the need to tailor information to its recipients’ attention span, represented a different perspective. We’re looking forward to extending this ‘conversation’ in the future. 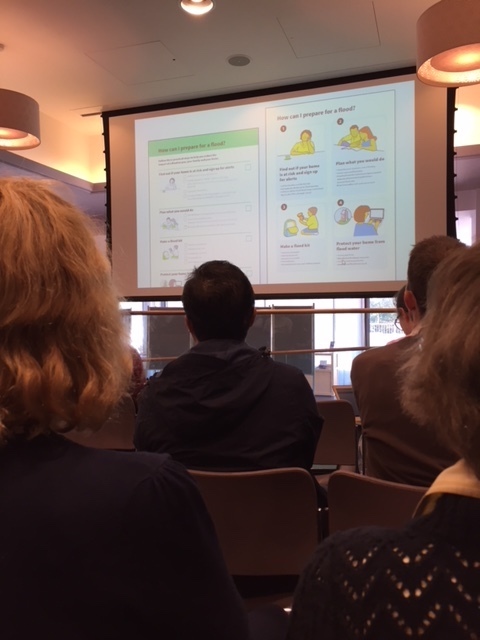 Sue Walker gave a keynote talk at the Design4Health conference organised by Sheffield Hallam University, 3–6 September 2018 entitled ‘Getting the message across: communication design and healthcare’. Here she discussed the role of communication design in explaining the science behind illness and disease; providing materials to assist with treatment and care, visualising data to measure quality improvement, and influencing behaviour change. She concluded by reinforcing one of the themes running throughout the conference – the importance of cross-disciplinary collaboration and early design intervention in bringing about effective, efficient and user-centred communication of information relevant to healthcare providers and recipients. One of her slides that caused interest (pictured above), was produced by the Isotype Institute for Stephen Taylor’s Battle for health (London: Nicholson & Watson, 1944). 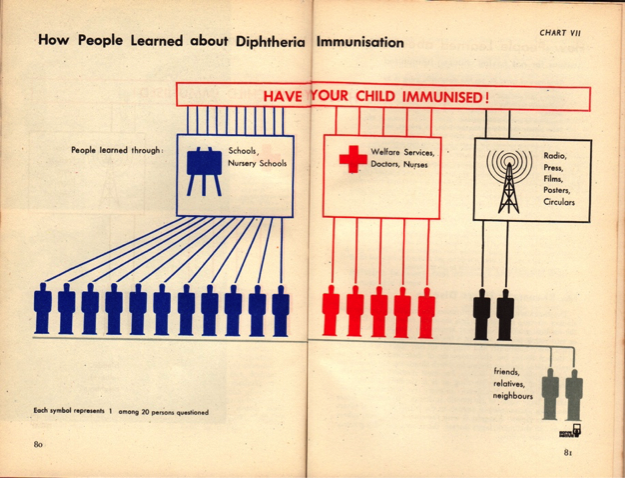 This chart shows the effectiveness of different communication channels in getting the message across about diphtheria immunisation, which was a pressing issue in the 1940s. 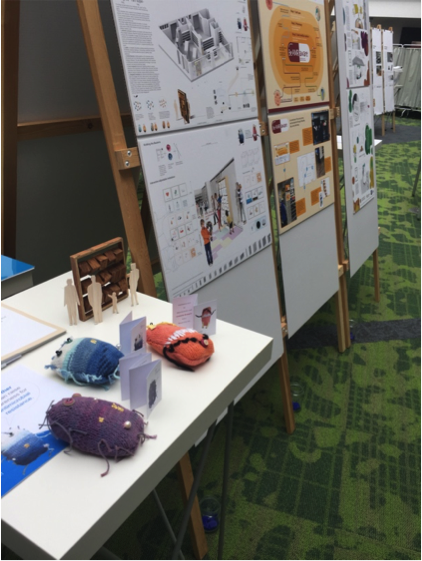 At the same conference the IDAPPS team (Information Design and Achitecture in Persuasive Pharmacy Space) presented a paper and displayed their work (some of which is shown below), designed to build public understanding about and engagement with how to protect against antimicrobial resistance, more of which can be seen here. Alison Black presented CIDR’s research on information design for dementia care and described the development of print materials and their subsequent transfer to digital formats at the conference Living well with books, organised by the Centre for Material Texts at University of Bristol, 5–7 September. This multidisciplinary conference brought together researchers with topics as diverse as reading in bed, the architecture of libraries, what children and adults can gain from making books, current and past literary culture from Bolton to Cuba, and the future (positive) prospects for books in the context of other media. 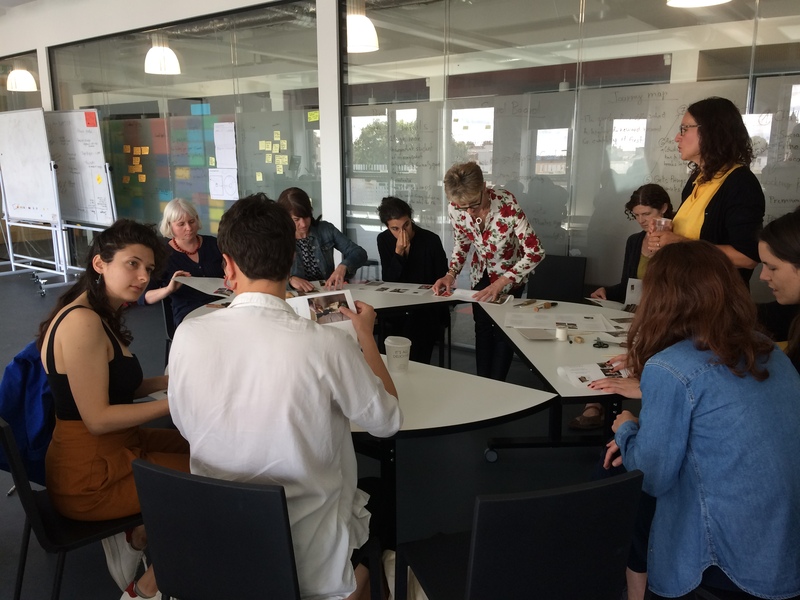 Research presentations were combined with practical workshops for participants to experience book making practice (picture below). 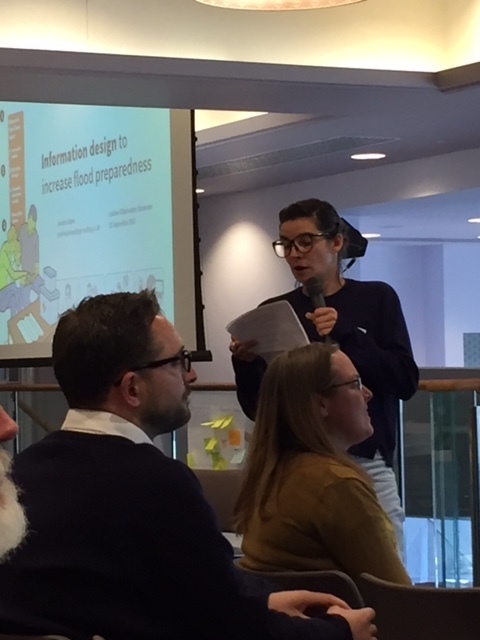 Jeanne-Louise Moys gave a talk at a day symposium, ‘Information design problems and solutions’, organised IIID/Simplification Centre, 9 September in Bath. Her talk ‘Learning to do vs. Doing to learn’, examined the importance of research and cross-disciplinary collaborations in information design education. She also drew on her experience in inclusive design projects to note the importance of ensuring information design plays a transformative role. 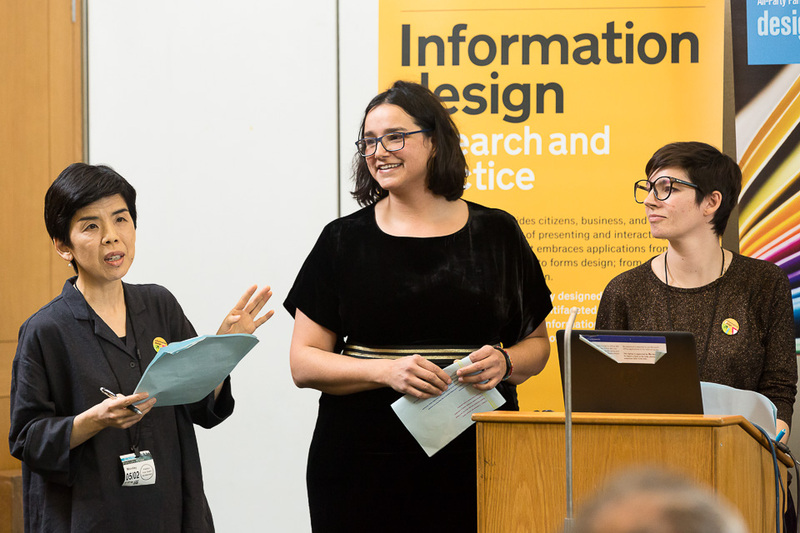 The symposium was well attended by information design researchers, including Matthew Lickiss, practitioners, and people working in sectors that use information design. 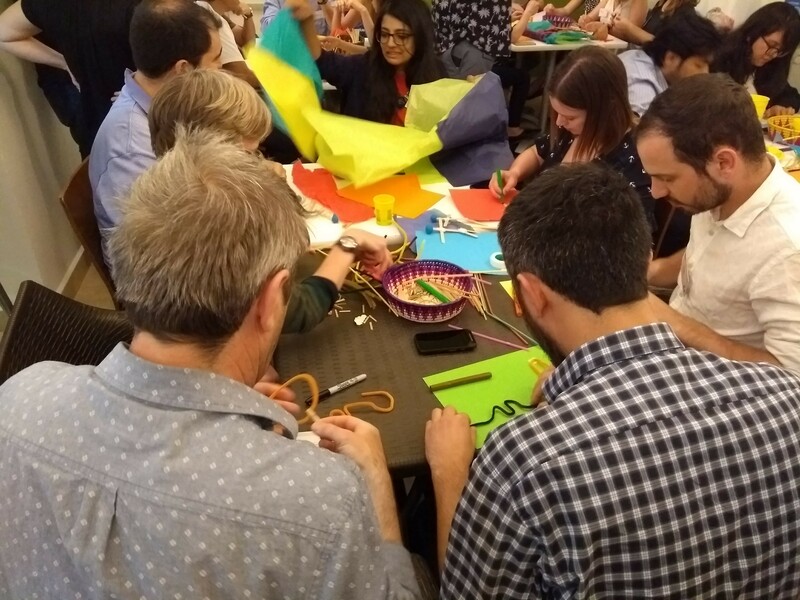 Our postgraduate researchers, Andrew Barker, Josefina Bravo and Rachel Warner were there, and MA information designer Richa Verma, as well as many Reading alumni. 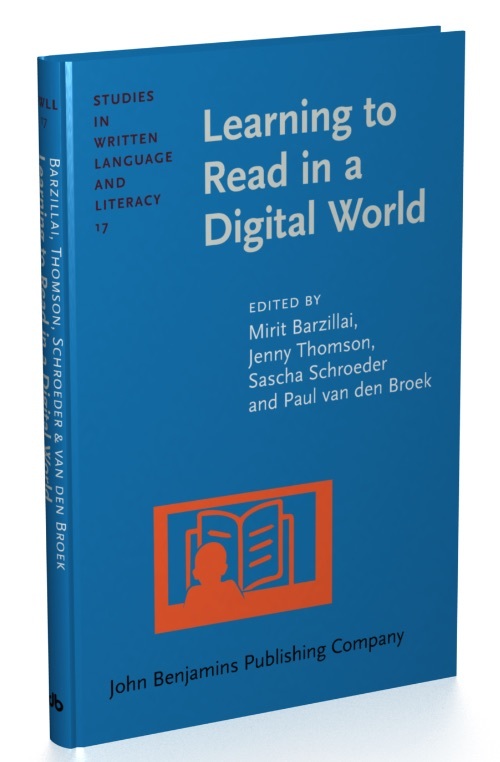 CIDR authors, Sue Walker and Alison Black, and colleagues from the School of Arts at University of Hasselt, Belgium, and information design consultancy Text Matters have co-authored a chapter in a new publication Learning to Read in a Digital World, edited by Mirit Barzillai, Jenny Thomson, Sascha Schroeder and Paul van den Broek. The book isone of many outcomes of the EU funded COST network e-Read, in which CIDR has been a participant for the last three years. Our chapter focuses on design to support beginner readers but the book covers wide-ranging topics from learning to read to reading to learn. We have been joined this summer by Part 2 student, Lauren Quinn, who, with funding from the University’s Undergraduate Research Opportunities Programme (UROP), has been working on an exploratory study to investigate how the broad context of food packaging influences people’s use of information about the healthiness of the foods the packs contain. There are many existing studies in this area, largely from researchers in food science. Such studies rely increasingly on digitally presented materials, often presenting specific aspects of food packaging, and typically tracking people’s decisions and response times over many exposures. 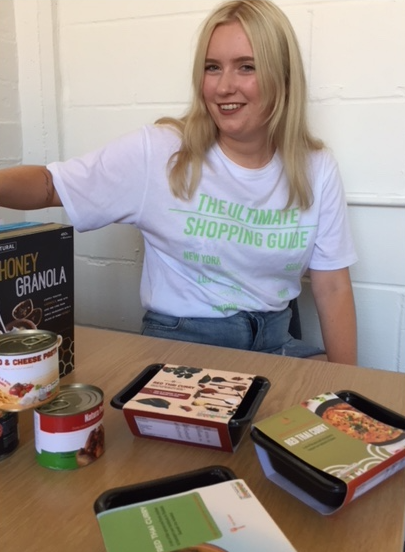 In our study we went back to basics, looking at people’s decisions based on prototype, three-dimensional packs, designed by Lauren to reproduce the characteristics of current food packaging. As part of this process Lauren analysed the graphic features of existing packaging to determine how design was used to draw people’s attention to and give signals about pack content non-verbally. In testing people’s decisions using her prototypes Lauren found that they were influenced by the overall pack context, i.e. the type of images and colours used, and also that there were differences in people’s responses according to whether they were asked to make rapid decisions or had more time for consideration. We are grateful to the volunteers around campus this summer who responded to Lauren’s request to participate in her interviews, and to the University for funding the project. Iztapalapa was the focus for the Understanding Risk Forum Pressure Cooker, where interdisciplinary teams worked on scenarios developed by local experts to propose ways of communicating about the natural hazards, including earthquakes and flooding, to which the area is vulnerable. In follow up to our post on the Understanding Risk Forum in Mexico, where Matthew Lickiss was part of the organising team for a Pressure Cooker workshop to develop new ways of communicating about risk of and response to natural hazards, we add this link to a write up by Lydia Cuminsky, of Water Youth Network, who led the workshop. 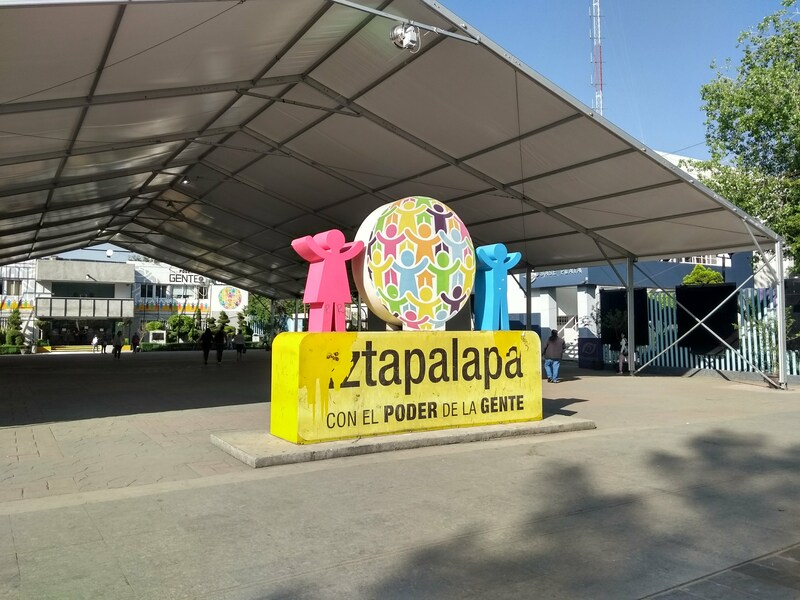 And after a fascinating tour of Iztapalapa, one of the settings for the hazard scenarios that workshop participants responded to, Matthew has provided some further information and pictures. Local experts, working to build resilience in the area, who had developed the scenarios, with input from local residents, took time to show how they respond to hazards, and are building resilience in the locality. Iztapalapa, one of the 16 municipalities of Mexico City (CDMX), is vulnerable to multiple environmental hazards, including earthquakes, subsidence, ground fracturing, and flooding. With a population estimated at 1.8 million in 2015, it is the location of 1/5th of the city’s illegal or informal settlements. It has high levels of marginalisation and 38.3% of the population have no access to health care. A new approach to administration, under the slogan Con El Poder de la Gente (With the Power of the People) has been working to increase trust and implement social decision making. We had the opportunity to visit Iztapalapa and see the systems currently in place to monitor, communicate, and educate about local risks, arriving just after 9am to find that the earthquake warning system had been triggered by a M5.3, earthquake to the south west of CDMX. The system is set to trigger at M5.0 and local people had gathered outside the town hall (although the depth of the earthquake meant that it had little surface effect and had gone entirely unnoticed by us). We moved immediately to a briefing by Enrique Guevara Ortiz, who demonstrated the earthquake monitoring and reporting systems with the Mexican Seismic Alert System (SASMEX) map, using the event that had just occurred. In addition to monitoring seismic activity through a network of sensors, SASMEX can also broadcast alerts and warnings. 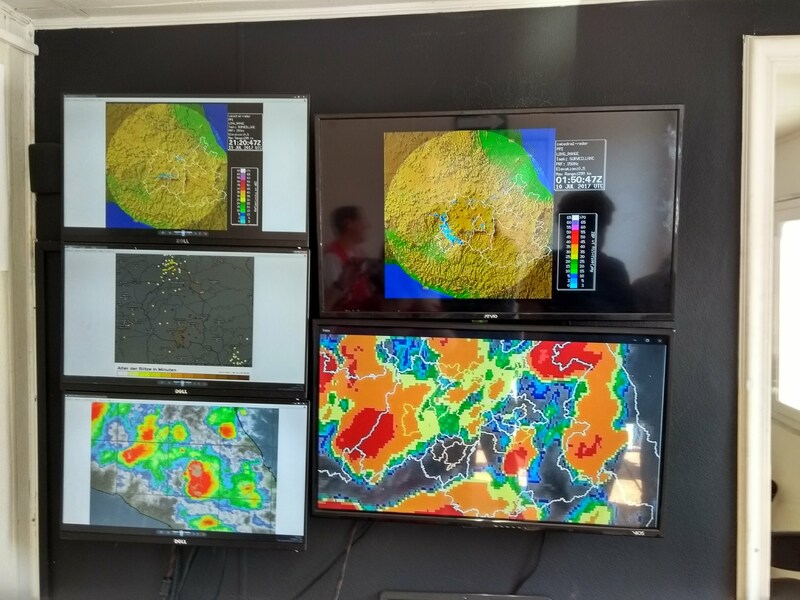 Earthquakes are just one of the risks in Iztapalapa and Luis Eduardo Perez-Ortiz, Director of Civil Protection for the municipality, showed us the busy control room for the Iztapalapa Multiple Early Warning System (SMAT). 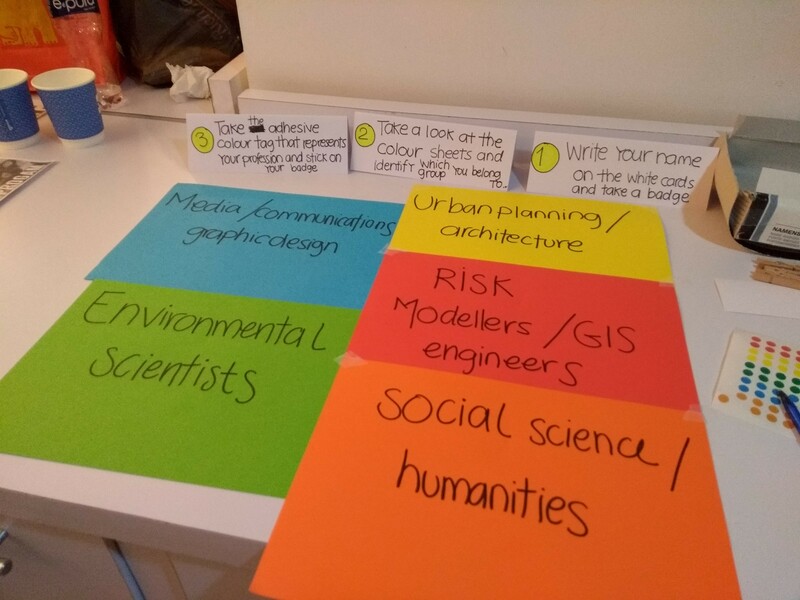 We saw how WhatsApp groups were used both to communicate with the public (giving information and alerts) and to create a dialogue for people to report potential problems that might exacerbate the risks from natural hazards. For example, subsidence and ground fissures in the area can crack buildings, making them more susceptible to damage in earthquakes, or litter and blocked drains that can aggravate flooding. A mobile education truck is used to increase awareness of flooding and the SMAT warnings. The truck combines a classroom with a flood warning system demonstration. A series of posters to accompany these covers six stages of warning and preparation in the event of heavy rains as well as guidance on specific actions, such as taking shelter, keeping drains clear, and preparing emergency bags (see posters here). The aim is to increase understanding and trust in the system by showing its functionality. In simulations, people visiting the bus can decide which warnings they would issue in which conditions, and see how they are implemented. Demonstrator warning system on the education truck for local people to take part in simulations. We were able to visit the home of Margarita, a local resident. Located on a street especially prone to flooding, with house doors below the level of the road, her home was being used to trial metal flood barriers that could be fitted into doorways. 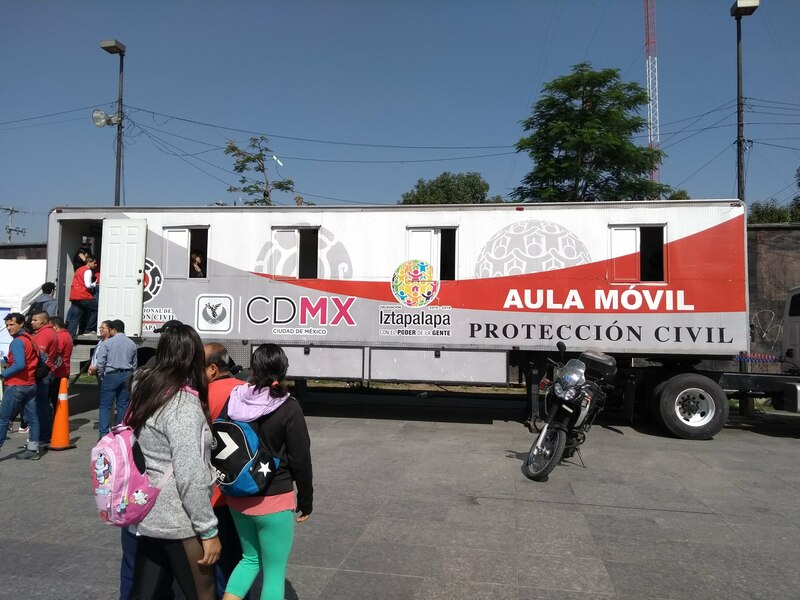 Her roof was also the site of a couple of the hundreds of SMAT warning speakers used throughout Iztapalapa to broadcast messages (such as those demonstrated on the truck) across the municipality in an emergency. Overall, SMAT provides a combination of high-tech monitoring equipment, social-media, and community engagement in a system that communicates not just warnings, but which also seeks to contextualise risks for residents. Thank you to Luis Eduardo Perez-Ortiz, Enrique Guevara Ortiz, and their teams for taking the time to demonstrate their systems. Snaps from Matthew Lickiss, from the ice-breaker event for the Risk communication pressure cooker at the World Bank 2018 Understanding Risk Forum in Mexico City. Matthew is a Senior Tutor at the pressure cooker – an interdisciplinary event examining how scientific information and technology can be harnessed to inform local decision making to reduce and manage natural hazard risk. At this ice-breaker, participants were making representations of what risk communication meant to them, as a focus for discussion. Matthew’s involvement in the event stems from CIDR’s work, with University of Reading’s Meteorology and Psychology Departments, in research on the communication or risk and uncertainty (for example mapping volcanic ash for air traffic controllers, and representing soil moisture forecasts for farmers in Northern Ghana). 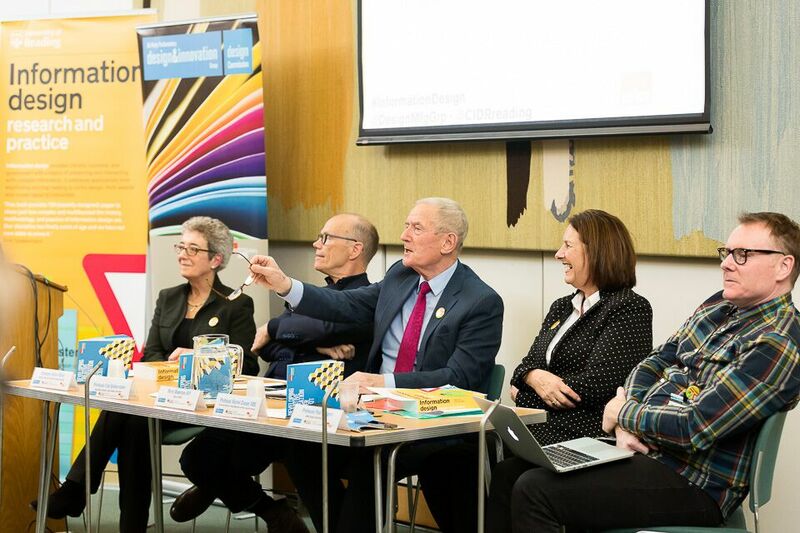 We were delighted by the enthusiastic, capacity attendance on 5 February at a parliamentary event to raise awareness of the importance of designing information for public understanding, and to celebrate our book Information design research and practice. The evening, co-organised with the All Parliamentary Design and Innovation Group, was opened by the Chancellor of the University of Reading, The Right Honourable The Lord Waldegrave of North Hill, and Barry Sheerman MP chaired a lively panel session and discussion (above). Topics ranged from information design that hadn’t worked as intended, through the density of information in legal and regulatory documents, to the use of information design in changing behaviours. The more formal part of the evening was concluded by a presentation from the Dear How to team, Josefina Bravo, Tomoko Furukawa and Sol Kawage, all graduates of our MA Information design course, who are near the close of a year-long challenge to each draw and send to one another a set of non-verbal instructions every week. We’re grateful to Lord Waldegrave and Barry Sheerman MP, respectively, for hosting and steering us so generously, and to the many parliamentarians, design professionals and researchers, including contributors to our book, who helped make the evening so lively and interesting (more pictures here). We’re looking forward to following up the many new ideas and connections stemming from the event. Last year, our graphic communication undergraduate students had the opportunity to undertake some exciting information design placements, including working on an inclusive design research project and designing infographics for the BMJ – (which may be more familiar to some readers as the British Medical Journal). We are involved in a cross-disciplinary research project exploring the role of icons in cueing therapy resources for people with aphasia. Carmen Martínez-Freile explored the appropriateness of different levels of visual complexity in illustrations used in cueing therapy. Part 3 student, Carmen Martínez-Freile joined our CIDR team to research the role of icons in cueing therapy. Carmen’s research was carried out as part of the University’s undergraduate research opportunities programme (UROP) and a wider research collaboration between Biomedical Engineering, Clinical Language Sciences and Typography & Graphic Communication, which brings together our shared interests in inclusive design and assistive technology. The project is supported by NIHR. 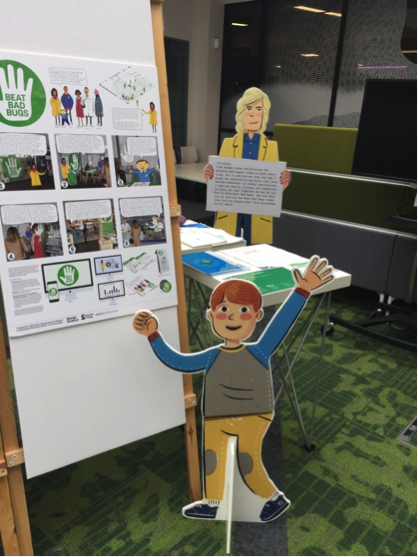 Working with Dr Jeanne-Louise Moys (CIDR), Professor Rachel McCrindle (Biomedical Engineering), Dr Holly Robson (Clinical Language Sciences) and other colleagues, Carmen explored the ways in which different kinds of visualisations might be used in cueing therapy. 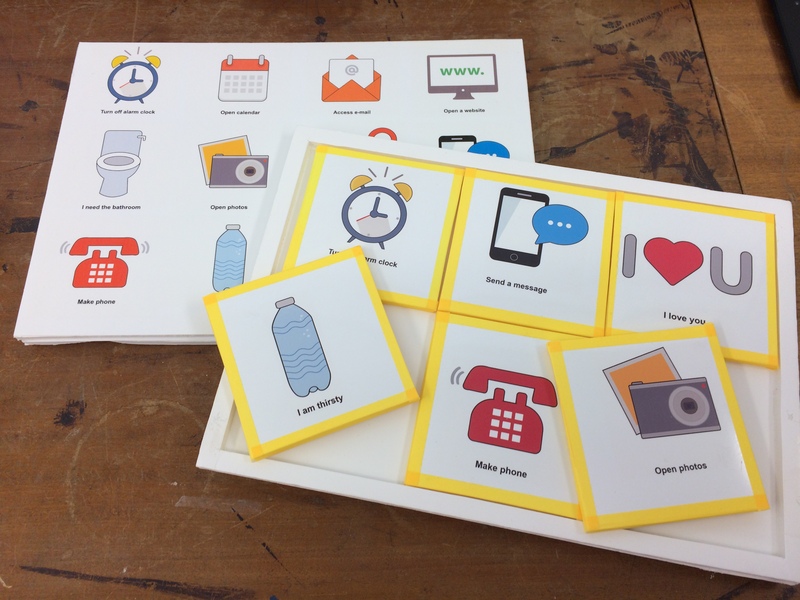 Carmen’s study explored participants’ preferences for different styles of illustration to help us identify which visual approach to apply to research materials used in assessing the effectiveness of illustrated boards used in cueing therapy. Contrary to existing guidelines, the findings of the focus group suggested that participants preferred simple icon-style illustrations. It is possible that participants’ familiarity with the kinds of icons they see in everyday mobile interfaces is why they found particular icons to be easiest to understand. Part 2 student, Fenella Astley undertook an information design placement at the BMJ. During her time there, Fenella worked on a number of infographics, including topics such as ‘Faltering Growth’ and ‘World Bank and Financing Global Health’. She also created a range of other data visualisations for the BMJ, including graphs, charts and forest plots. Will Stahl-Timmins (BMJ Interactive Data Graphics Designer and a regular guest contributor our undergraduate data visualisation projects) said: “Fenella took on board the house style for infographics incredibly quickly, and having her input allowed us to get further ahead with the infographics schedule than ever before”. Fenella has already applied some of the skills she developed at this internship to her Graphic Communication degree coursework. We look forward to future collaborations. How far has information design infiltrated parliamentary discourse? Information design researcher, Karel van der Waarde, whose work has influenced European legislation regarding the design of information communicated in patient information leaflets for packaged medicines, has recently carried out an informal search for references to information design in Hansard, the record of UK parliamentary proceedings. In the last seven years, the word ‘typography’ was not mentioned once. The word ‘diagram’ was mentioned 68 times, although in some cases less positively than others. Here are some indicative examples. The last quotation by John Pugh MP parallels a similarly disparaging comment in 1994 by Betty Boothroyd, the House of Commons Speaker, “I have always believed that all members of this house should be sufficiently articulate to express what they want to say without diagrams” (see post at Macro-typography). It does seem, however, that thinking is moving forward to alternative or complementary ways of presenting information where words alone are difficult to navigate. Karel notes that in many instances where the word ‘diagram’ is used, the speaker is asking for clarification, ‘maybe a diagram would be helpful’.